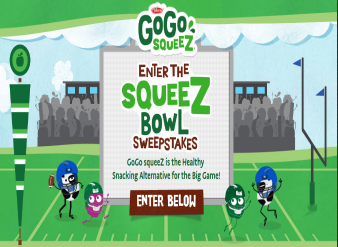 GoGo Squeez Sweepstakes – Win a case of GoGo Squeez! Win a case of GoGo squeeZ (20 winners)! SWEEPSTAKES ENTRY PERIOD – The Sweepstakes begins on or about 10:00 A.M. Eastern Time (“ET”) 1/2/2018 and ends at 11:59:59 PM EST on 1/21/2018. PRIZES – Prize (20): Twenty (20) winners will receive one (1) case of GoGo squeeZ® applesauce and/or YogurtZ, including sixty four (64) pouches.